A kid's movie? Me? I know. Shocking. So with all of the special effects, violence, and testosterone-filled flicks these days, it's no wonder when sometimes kids movies get a little beefed up. In the case of Rise of the Guardians (which I keep getting mixed up with Legends of the Guardians, which is a very different movie...) the formula actually works pretty well. While many have tried before to make Santa Claus a little less jolly and a bit more deep, there are innumerable times when this representation of the jolly gift-giver seriously and atrociously fails. However in this movie, I was impressed to find how likable the characters remain, and how many mythical beings get a little more limelight. It's The Avengers for kids! 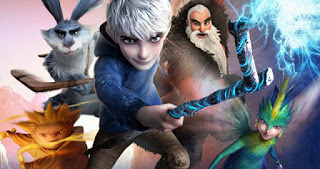 The story revolves around Jack Frost, who, in a nut shell, can make things really cold. Giving little kids Snow Days and causing minor mayhem is his favorite, and he loves to help little kids have fun on their days off from school. The only problem with Jack, though, is that no child can see him. 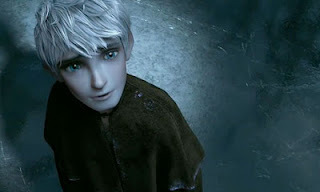 In an interestingly accurate presentation, kids do not acknowledge Jack Frost because they have never heard of him. And in the world of the film, if a child does not believe in a mythical creature, they can't see them. Which is where the conflict in the film comes in. If you can't see this picture, then you don't believe in Jack Frost. Pitch Black, also referred to as just "Pitch" (which had me chortling in my seat cuz it sounded like they were saying somethin' else...), is the mythical creature known as the boogie man. Being a little uncomfortably scary, even for me, he has been unseen by children for decades. The dude gets fed up with being invisible and starts a war with the mythical creatures so that they will feel his pain. His mayhem stirs up many problems in the mythical creatures' worlds, and without the unfailing faith of children, their extinction knocks at the door. DUN DUN DUUUNNNN. He's like Saruman for kids! 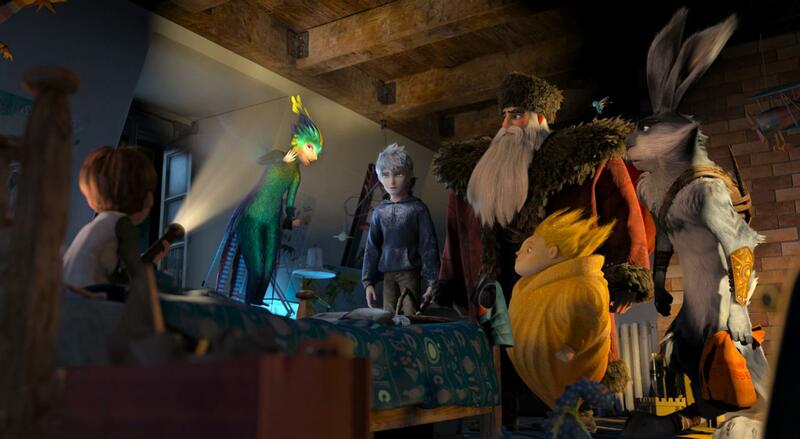 The mythical creatures in this flick include Santa Claus (voiced by Alec Baldwin), a robust, tattooed man with a strong Russian accent; the Easter Bunny (voiced by Hugh Jackman), a spry guy with an Australian accent and a boomerang; the Tooth Fairy (voiced by Isla Fisher), a class-A spaz that looks to be half hummingbird; the Sandman, adorably short and mute, who uses his golden dust to communicate with his buds; and Jack Frost (voiced by Chris Pine), who always looks freezing (d'oh ho ho...no but seriously, he made me cold). 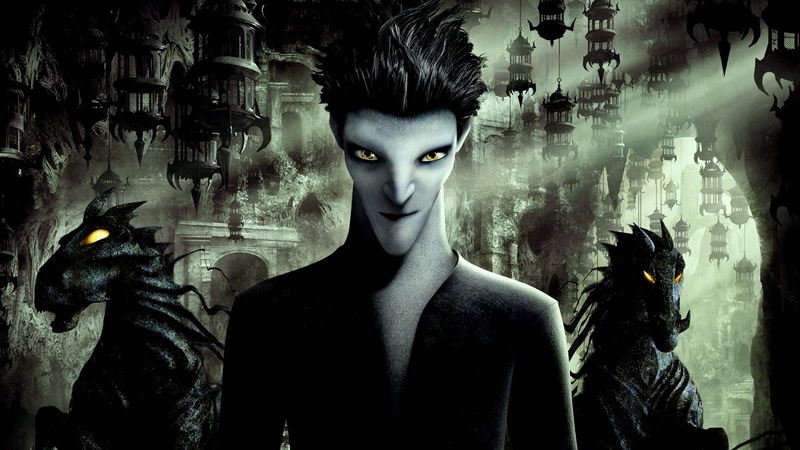 All of these creatures have such strong and separate personalities, the film ends up working quite well. Even though they all seem to be a little more human than most illustrations have depicted them in the past, this works for the film. Instead of softy things, they really pack a punch, and are not going down without a fight. And, quite, honestly, their reality makes them even funnier. Of course the cutest thing, as with all movies involving holiday icons, is the purity of the belief of children that these things exist. When all looks lost, one child's faith in the Easter bunny is what ends up saving them all. 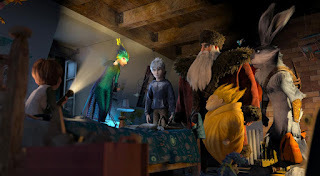 And the fact that today kids are still choosing to believe in things like Santa (probably the easiest one), the Easter Bunny, the Tooth Fairy, the Sandman, and even Jack Frost, I'm sure, after this movie, really warms my heart. Even if these versions are more built to be fighters than the classic representations. Sweet movie that was hugely entertaining. Highly recommend.